Robert was last seen playing outside with his siblings between 2:30 p.m. and 4:30 p.m. He was last wearing a red, blue, and gray shirt, blue pants, and boots. He has a 2x3 red birthmark on outer left thigh above his knee. He has trouble pronouncing the letters T, K and R. He is also known as Bobby Joe. I have been asked to look at the Tarot for Robert Joseph Fritz. I have had a missing alert up for this young boy since September and I assume at the date of writing that he is still missing. Please read all the notes regarding Tarot and please note that Tarot looks at past present and future elements. It will not provide every single detail but perhaps something may be of use. It is always advisable to read other factual sources. My first card immediately gives me the impression that Robert was picked up on the road or was given a lift. This card would certainly suggest someone in a vehicle who makes us disappear rather rapidly. I also sense a lot of oppression here and being between two places. Tall trees and rolling hills might come up in this picture. The direction seen is South which could be a road/route name or actual wind direction and we have number 14 which could be split up or added together to give 5. A 'brown mountain' is often seen in this card which might be a clue to an area. The colour red yellow gold and orange. North East may come up also. Person description might be (or may be keywords for areas) Someone large with around head and prominent eyes. Strong and active body taller than average,fair or sandy hair, or chink of red, maybe with natural curl or inclined to baldness. The sporty element may describe this boy's hometown. This card can stand for burns/fire and sport. We also have water elements here and somewhere there might be a bridge over a fast flowing river. Places in the vicinity or surrounding landscape or again, could be keywords are theatres, public buildings and monuments, public halls, auditoriums, parks, names that sound Royal such as prince, king etc and palaces, castles, forts. Inaccessible places come up such as deserts, forests and areas where wild animals roam. Construction or construction workers might come up or Hunters. Burning elements such as fire or heat, chimneys etc. The 5 might give us the word Key, Quay, Kay or it is a K initial. This card is West, it is however reversed (East? )which might affect it but I shall see what other directions can come up here. West could also be in a name. Water is the element on this card so it would rather suggest water either in name or place. The card represents a tree and an island so that may be a factor or clue and also we have the word Union and a bridge with a fast flowing river . The Bell word is here . There are five points of water. Number 4 is a route or direction or it can represent a vehicle or even a father or older male figure. This boy may be linked to a man with odd sexual appetite. This can happen when cups are reversed. There is also some kind of container here. I am seeing two children missing? Has any other child gone missing from the same area? This is the sign of a new acquaintance so I do think that someone has met up with this boy and taken him with him. I might be wrong but it looks that way to me. North is given but South may also be here. These areas will need to go onto the Map which will be produced if you are able to check back. The card is reversed and I have to be careful that the North is not South. They could be names of roads or actual wind directions. Im just getting images of water places or keywords for names of places that represent the sea, rivers and places near ponds or waters - brooks, springs, wells, wash-houses, sea shores highways, port towns, desert places , marshy land, also links to cellars, cisterns, bathrooms etc might even be a plumber? fisherman? or some connection to those names. I see drinking? or someone drunk. Heres an interesting card suggesting that Robert could be found. It seems a long time to come up with a positive card such as this but thats what I have. This is a yes card and gives a family home on a hill - with a river nearby. The name Ray might come up. Maybe it is suggesting that this boy is not far from his family home town as this is the original hometown card so likely he is in his own hometown at least that is what this card could suggest to me. I would check all the water areas. Routes 1 and 10 if there are any or if these numbers come up in anyway linked to anything. The answer here for when this boy will be found is 'one day'. North West is the direction. All the information in card two regarding water/places comes up here, so does church or church names like priest or bishop etc or spiritual elements and also university, college type names and a Thursday. It seems to look quite positive at things of course I cannot say if it will be an actual fact or not but one day does not mean this young lad will be lost forever, it is suggesting he will be found eventually. Please read all the information and combine it. Remember it is past present and future and until something comes along to validate any points here it is not considered to be FACT only possibilities. I hope something might help. I have somewhat of a gift and I'm pretty sure I found him back in March 2013 When I told what I knew to the FBI from Springfield, Il and a detective from WI they said they would look into it. They eventually said that "Brad" was not him. Oh, did I forget to mention "Robert's" (Bobby) dad was a cop and a friends with "Brad's" dad???? Who lived in his original hometown (IL) Could that be why it "wasn't" him??? lol (please!) If I'm right then you did get a lot of the info right. 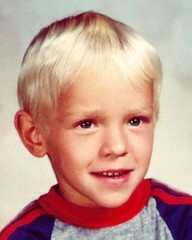 I even had a picture of Brad and it looked just like the age progression picture on the missing children site. He lives in Missouri now, went to college, but hey, what do I know, right??? Before the FBI looked into it they did say that it could cause me a lot of problems if what I predicted was true. Any insights into any of this? I dreamt of him several times when I was younger. In the dream I saw him get into a a lighter colored blue car, maybe late 1970's (a Bonneville type of car as I only saw the tail lights) with a man driving. I felt rather than saw, that he is near a ravine of some kind, not far from where he lived. I don't claim to have any kind of psychic power or gift. I just had a reoccurring dream about him that happened over several months.